As part of the Latvian centennial celebrations, and to find a drawing for a new collector’s coin, the Bank of Latvia initiated a children’s drawing competition. 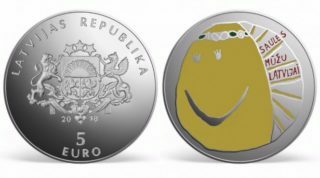 Among 10,000 submitted drawings, the winner of the competition was Elizabete Kandere, and her drawing appears on the new collector’s coin entitled ‘Mana Latvija’ (My Latvia). The silver coin has a mintage of 4000 and was minted by the Koninklijke Nederlandse Munt in the Netherlands. The design of the coin was prepared by artist Sandra Krastiņa and the plastic model was created by Jānis Strupulis. For further information, please visit the Bank of Latvia’s collectors’ coin website.